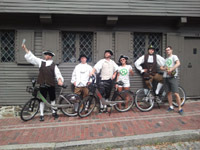 Getting Around - Inspired Beverage Inc.
Boston offers a variety of transportation modes for residents and visitors alike to navigate in and around the City. Walking - Chances are you’ve heard Boston referred to as “the walking city.” The City of Boston works hard to live up to this title. Our Public Works and Transportation Departments are constantly marking crosswalks, performing regular maintenance of traffic signals and pedestrian pushbuttons, and using innovative pedestrian safety signs at busy locations such as downtown Boston. Schools, parks, playgrounds, elderly complexes, and public libraries are also a top priority for these new safety improvements. Driving - Boston has developed a reputation for having savvy drivers who are able to navigate the city’s historic cobblestone streets with ease. Many of Boston’s streets were once horse-cart paths and today present a challenge for drivers in those ubiquitous SUV’s. Parking can be difficult but with services such as vanpools and car-sharing companies, it is possible to navigate the city capably. Bicycling - Mayor Menino is committed to improving the bicycling climate in Boston. Boston Bikes is part of Mayor Menino’s vision for a vibrant and healthy city. The program seeks to make Boston a world-class biking city by creating safe and inviting conditions for all residents and visitors. Boston Bikes is focused on five planning areas: engineering, enforcement, education, encouragement, and evaluation. Commuter Rail / Subway / Bus - Thousands of residents and visitors use the extensive MBTA system of trains and buses to get in and around Boston. Over 300,000 people commute into Boston daily for work. Public transportation via bus, subway, and commuter train serves as a vital link between Downtown and surrounding neighborhoods and the greater Metro-Boston area. Taxi - Boston’s taxis are regulated by the Boston Police Department’s Hackney Carriage Unit. Under the authority of the Acts of 1930, the Police Commissioner appoints a unit commanded by a BPD Superior Officer to regulate the taxi industry. The Hackney Unit is the oldest specialized unit in the Police Department and is in charge of setting standards and licensing the taxi companies operating in the City of Boston. The Department has been working to promote greener, fuel-efficient taxis through the Clean Air Cab program, providing online services to improve customer experience, and implementing the use of credit fare readers. Amtrak / Coach Buses - Amtrak and coach bus services provide alternative modes of transportation for traveling longer distances in and out of Boston. Amtrak runs trains out of Boston's North Station, South Station, and Back Bay Station, while Greyhound, Peter Pan, BoltBus, Megabus and Plymouth and Brockton companies run buses out of Boston's South Station to destinations across the U.S.
Boat - Boston's Harbor helps connect residents and visitors to neighborhoods such as Charlestown and East Boston via water taxis. The Harbor is always buzzing with a variety of sea-faring vessels ferrying passengers to and from locations along the water. It is a great way to see the city skyline and some of Boston's famous buildings.